It is my great pleasure to welcome our friends from Uruguay to this special session of the Development Centre’s Governing Board. Today’s impressive turnout reflects the importance we all — OECD and non‑OECD countries alike — attach to deepening our collaboration with Uruguay. 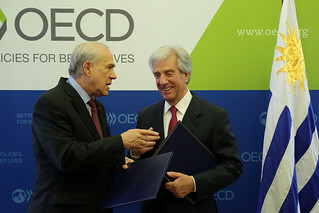 30 October 2015 (from left) OECD Secretary-General Angel Gurría and President of Uruguay Tabaré Vázquez at OECD Headquarters, Paris, France. Uruguay becomes the Development Centre’s 51st member and our 10th from Latin America and the Caribbean. I would like to acknowledge the leadership and personal commitment of President Vázquez, Minister Astori and Vice Minister Ferreri in achieving this important milestone. President Vázquez, you once observed that ‘’It is not enough to have growth. You have to distribute wealth throughout all of society.’’ This sentiment reflects precisely the objectives of the Development Centre. Through evidence-based analysis and policy dialogue among our diverse membership, we seek not only to stimulate growth, but to ensure its benefits are fairly and efficiently distributed in pursuit of better living standards and opportunities for all. There is much to learn from Uruguay’s experience. Over the last few decades, Uruguay has skilfully navigated its way through economic and political turbulence, demonstrating its resilience and resolve. And its achievements are impressive. Poverty and income inequality trends in Uruguay have improved significantly. Uruguay’s middle class is one of the largest in Latin America. Income inequality in Uruguay is among the lowest in the region.Institutional quality is strong. Growth projections are promising, with 2.4% expected in 2015 and 2.6% in 2016, above the regional average. And Uruguay’s commitment to the well‑being of its people remains strong and unwavering. Ambassador Duquesne has already outlined the extensive collaboration between Uruguay and the Development Centre. Of course, Uruguay also participates in several OECD activities, including the Global Forum on Transparency and Exchange of Information for Tax Purposes and, more recently, the Committee on Fiscal Affairs. It has also supported OECD initiatives in Latin America – Montevideo hosted the 2014 Latin American Competition Forum and the 2013 Latin America and Caribbean Tax Policy Forum. Membership of the Development Centre will offer new opportunities for Uruguay to tap into OECD expertise in education, skills, social inclusion and health. It also positions Uruguay to support the planned Latin America and Caribbean Regional Programme, which we hope to launch at the 2016 MCM, by bringing OECD best practices to the Southern cone. President Vázquez, I welcome Uruguay to the Development Centre and congratulate you and your administration for making this fruitful partnership possible. But my sights are also set on the future. I look forward to working together to design better policies for better lives. Ministers, Ambassadors, Ladies and Gentlemen, I am privileged to present President Tabaré Vázquez of Uruguay – a man of the people, who has selflessly dedicated his life to public service, both in politics and medicine, to chart a better future for all Uruguayans. Mr. President, the floor is yours.